Dance Workshops: Guitarists Are Welcome! Taught by Holly Blazina & guest dance instructor, Ilse Gudiño at Evergreen Studios. Guitarists can participate in all the workshops for $150. Space is limited! Please contact Holly about the the workshop prep series and the free preparation materials on offer. All shows are available at a discounted rate for workshop participants. Contact Holly for your registration form or to perform at the jam at the Cornerstone Music Cafe from 7 – 9 pm. 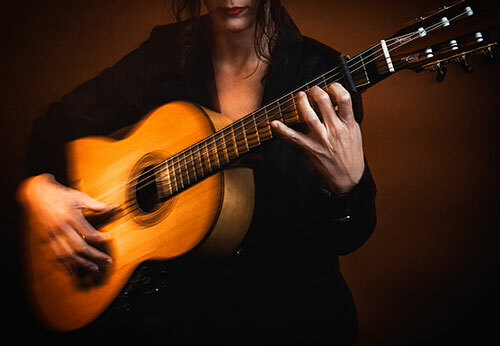 Guitarists, dancers and flamenco novices welcome! Want to get your flamenco groove on? Palmas are an indispensable part of the flamenco ensemble and an important study foundation. These workshops will feature 12-count forms. A listening list will be provided for study at home and in the car. Both seasoned flamenco students and beginners are welcome! Dates: Saturday, June 16, 11:00 am – 12:30 pm. Guitarists get a bonus group lesson for 30 minutes at the end, until 1 pm. Cost: $35 per class, in advance only ~ Friends, family & partners welcome!